At an annual gathering of the nation's industrial and academic chemists, two Sto-Rox High School seniors presented research they completed at Duquesne University this summer. The students, Emily Janicki and Charles Thornton, gained this opportunity to attend the American Chemical Society's (ACS) Indianapolis meeting Sept. 8-12 through the Project SEED program at Duquesne. Project SEED encourages the study of science by high-achieving students from financially disadvantaged households, an initiative intended to promote individual development of talent as well as to increase diversity in the field. The program gives select eligible students access to paid opportunities to partake in a Duquesne laboratory research project over the summer, learning lab techniques while contributing to research. 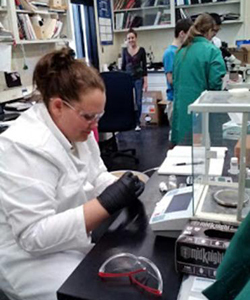 Through an auxiliary program, high school chemistry teachers also enter labs to enhance their skills. "Particularly with the current emphasis on STEM (science, technology, engineering and mathematics) subjects, it's important for students with diverse backgrounds to consider careers in chemistry and other sciences," said Dr. Jennifer Aitken, coordinator of the program and associate professor of chemistry and biochemistry. "Besides encouraging individuals to make the most of their talents, the program helps to bolster the quality and expand the diversity of those entering the field." Aitken has been leading the Duquesne program since its inception. Under her guidance, the program won the ACS top award for effectiveness, the ChemLuminary Award, and several students have received competitive college scholarships awarded by the ACS. Janicki, who returned to Project SEED for the second year, worked with mentor/graduate student Kimberly Rosmus on Utilizing Scanning Electron Microscopy for Use in High School Chemistry Laboratories. Thornton, also a returning Project SEED researcher, worked with mentor Dr. Partha Basu, chemistry professor, on Cloning and Overexpression of Periplasmic Nitrate Reductase. With four other students, they presented their research at a 10-year anniversary event this summer, along with alumni who shared how Project SEED helped to launch their careers. More than 50 supporters, high school teachers and administrators, university faculty, mentors, industrial scientists and local chemical organization representatives attended the July 18 event co-sponsored by the Bayer Foundation USA. If your company is interested in supporting the program, or if you are a teacher interested in participating in Project SEED next year, contact Aitken at aitkenj@duq.edu, preferably before the end of the calendar year.